Climate change is happening. The direct and indirect effects of climate change have broad-reaching implications for the San Diego Water Board’s mission to protect and restore uses of water. The State of California regularly compiles a variety of information on science, news, and actions at the Climate Change Portal. The State and Regional Water Boards have a key role in the State’s implementation plan known as Safeguarding California. For instance, sea level rise, ocean acidification, and changes to precipitation patterns, groundwater levels, and temperature will influence how we ensure that water is safe for drinking, swimming, fish and shellfish consumption, and ecosystems. 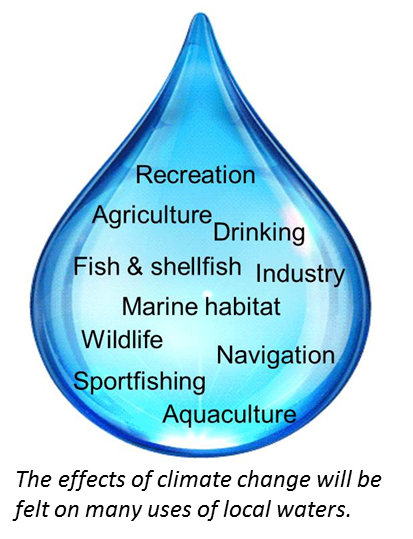 The California Climate Change Center produced a climate change impact report (2009) summarizing some of the threats to the San Diego Region. And, the Climate Science Alliance has produced a report on effects of climate change to the region's ecosystem (2018). Accommodating higher tidal surges by armoring coastlines could restrict recreational uses of beaches and bays. Managing larger volumes of storm water by modifying stream channels could disrupt ecosystem uses of streams and wetlands. Relying on natural attenuation of soil contamination could be risky if the area may become inundated due to sea level rise or rising groundwater. * Key areas are identified in "Key Beneficial Uses and Key Areas: Focusing on What is Most Important" adopted by San Diego Water Board Resolution R9-2017-0030. Considering the Science: Meeting with Scripps Institution of Oceanography and Southern California Coastal Waters Research Project. SUBSCRIBE TO EMAIL LIST To stay informed of San Diego Water Board activities regarding climate change, subscribe to our climate change email list at https://www.waterboards.ca.gov/resources/email_subscriptions/reg9_subscribe.html. CONTACTS For additional information contact Jeremy Haas, Environmental Program Manager, at Jeremy.Haas@waterboards.ca.gov or 619-521-3009.